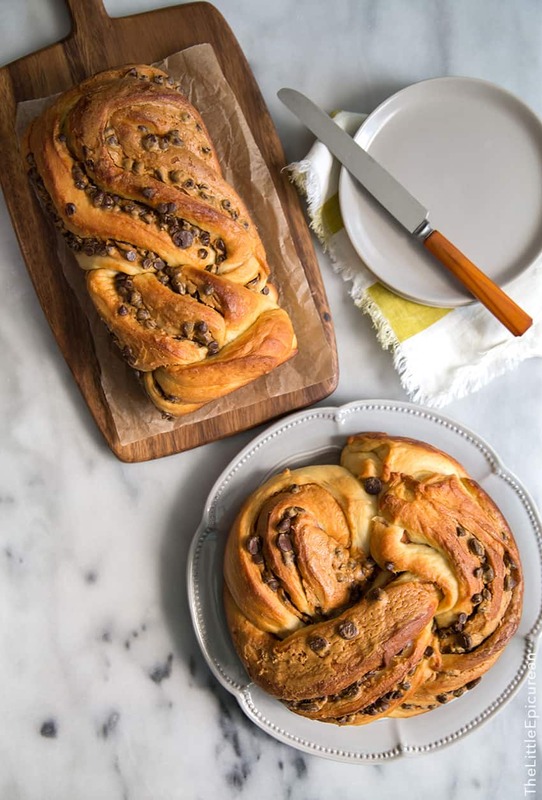 Two of my favorite flavors come together in this tasty and decadent peanut butter chocolate chip twisted swirl bread. Life definitely changes after a family member passes. Seven months later, I’m still missing my papa more than the day before. It doesn’t help that Father’s Day is this weekend. Whether it’s an ad I hear on the radio or an email reminding me it’s time to buy gifts, I’m constantly reminded that he’s no longer here. I still think about him whenever I’m baking and testing new recipes. I’d wonder what he’d think about this cake, or these cookies, or whether he’d try one of my cocktail floats. Regardless of whether my baked goods turned out okay, he’d happily it eat. One time, I accidentally rolled snickerdoodles in a cinnamon-salt mixture and he STILL ate it. Although he said it tasted “different,” he continued to eat it just to make me happy. As he got older, his taste buds were all over the place. There were only a handful of flavors that he could successfully point out. Among them were peanut butter and chocolate. 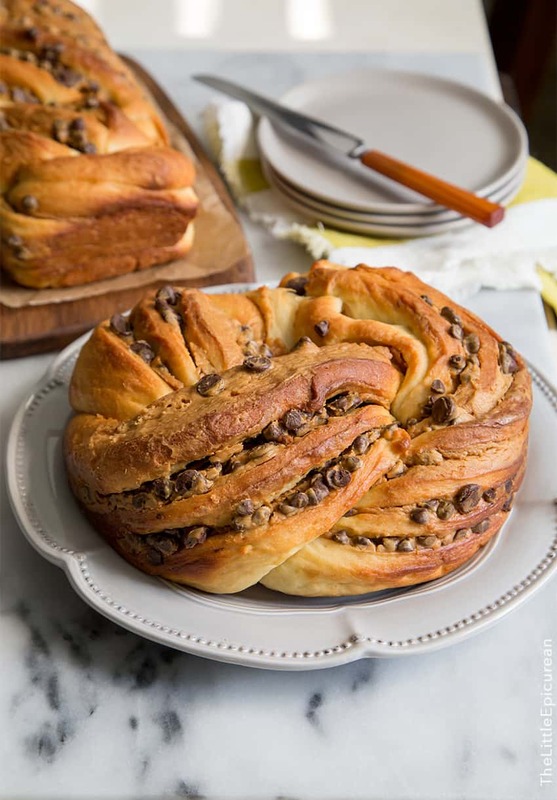 This peanut butter chocolate chip twisted swirl bread would have definitely won my dad’s approval. 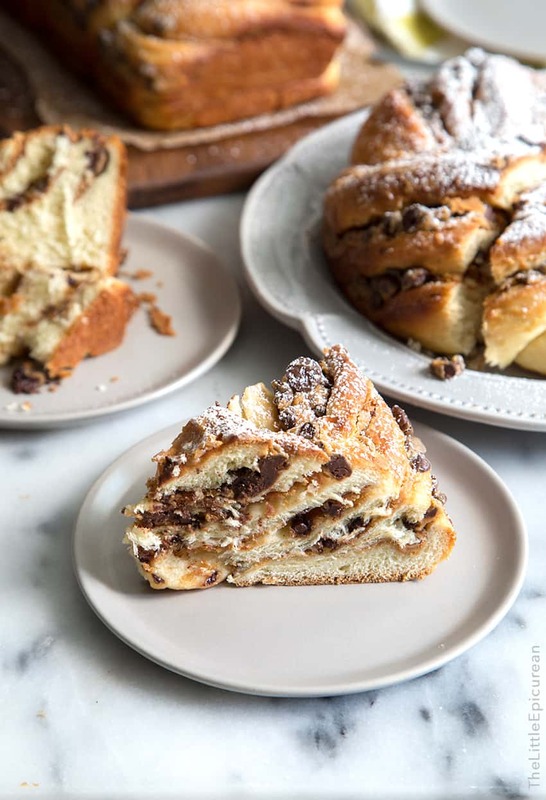 I’ve made several variations on swirl breads. (Berry Nutella, Rum Raisin Cinnamon, Cinnamon Raisin) I love the way they look. I love how well the filling is distributed thoroughout the dough, giving you the perfect amount of filling and bread with each bite. I used regular smooth peanut butter for this recipe- the shelf stable kind that doesn’t require stirring. When it comes to baking I stay away from the more “natural” peanut butter because I’ve had disasters with the peanut butter separating in the oven. I used a mixture of mini chocolate chips and regular sized chocolate chips. You can use one or a mixture. The baked peanut butter with the little melted bits of chocolate tastes amazing. I imagine it’s what a warmed up Reese’s peanut butter cup would taste like if it was smash on a soft pillowy piece of bread. For the finishing touch, I dusted a little powdered sugar over the cooled bread. 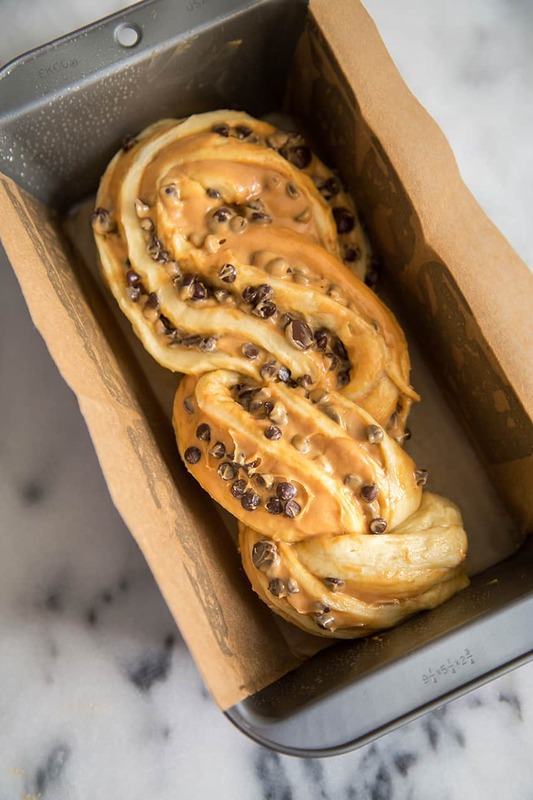 Overall, I’m very satisfied with this pb choco twisted swirl bread. It thoroughly exceed my expectations. 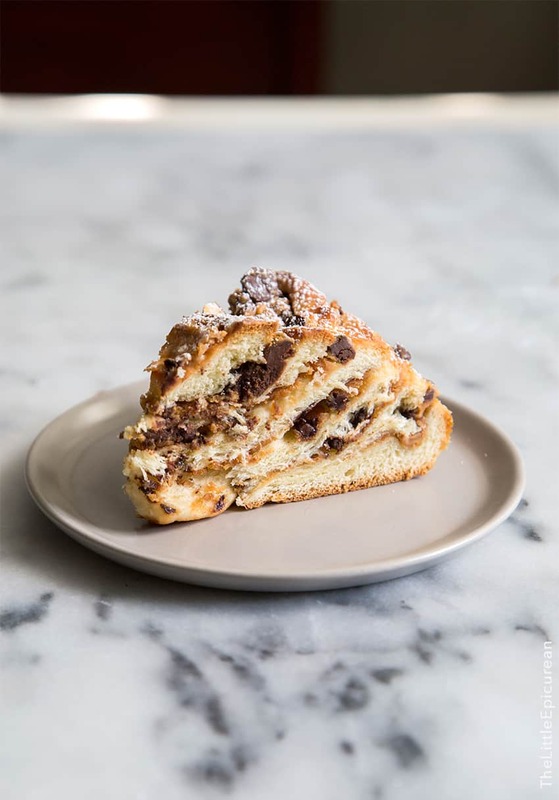 Asides from eating slices on its own, it’s perfect for bread pudding and French toast- all of which my dad would have happily devoured. Sprinkle yeast over warm water. Add teaspoon of sugar and stir to combine. Let sit for 5 minutes to allow mixture to bubble and activate. In the bowl of a stand mixer fitted with a paddle attachment, combine dissolved yeast mixture, yogurt, eggs, salt, and remaining 1/4 cup sugar. One combined add 3 cups of flour, 1 cup at a time. Remove paddle attachment and switch to a dough hook attachment. Add butter in three additions with the mixer running on medium. Add remaining flour. Continue to knead until dough is smooth and cleans the sides of the bowl. If too is too sticky, add flour one tablespoon spoon at a time (up to 3 tablespoons). Transfer dough to a lightly greased bowl. Cover bowl with plastic wrap and let sit at room temperature for 60-90 minutes until dough has doubled in volume. Punch down dough. Divide dough into two equal portions. Cover one dough with plastic wrap. Transfer the other dough to a lightly floured work surface. Roll to a 16 x 12-inch rectangle. 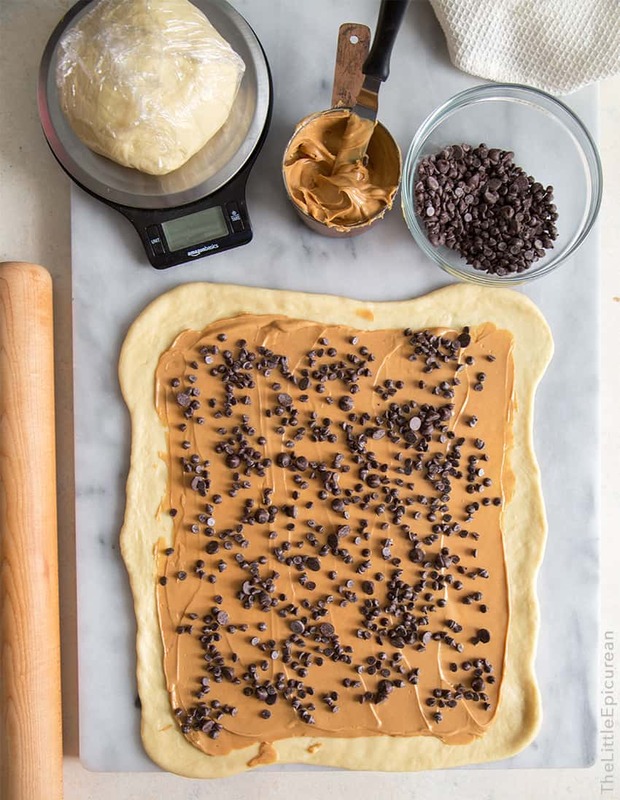 Spread 1/2 cup peanut butter evenly over dough, leaving a 1/4-inch border around all the sides. Sprinkle 1/2 cup of chocolate chips over the peanut butter. 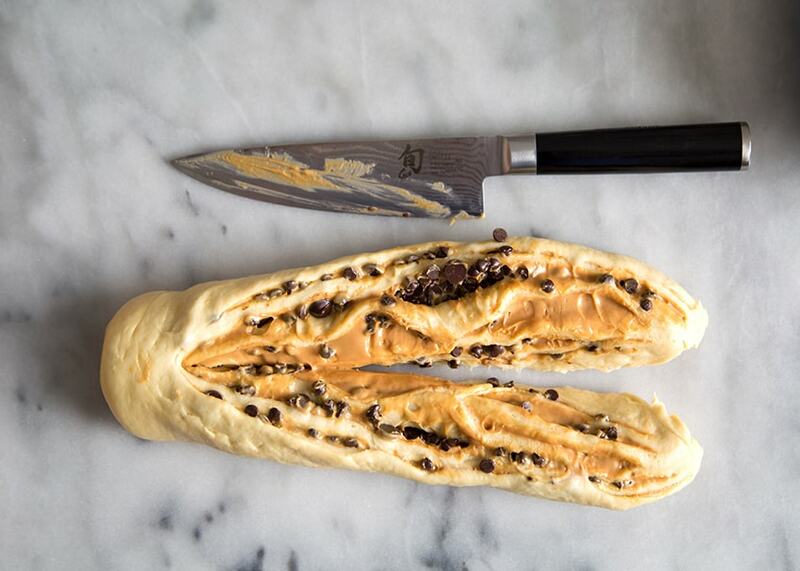 Gently press chocolate chips into the dough. Roll dough into a tight log, starting with the long side. Slice the log down the middle lengthwise. Twist the two halves of the dough over each other, making sure the cut is facing up. Tuck the ends of the dough into itself. Repeat with remaining dough. 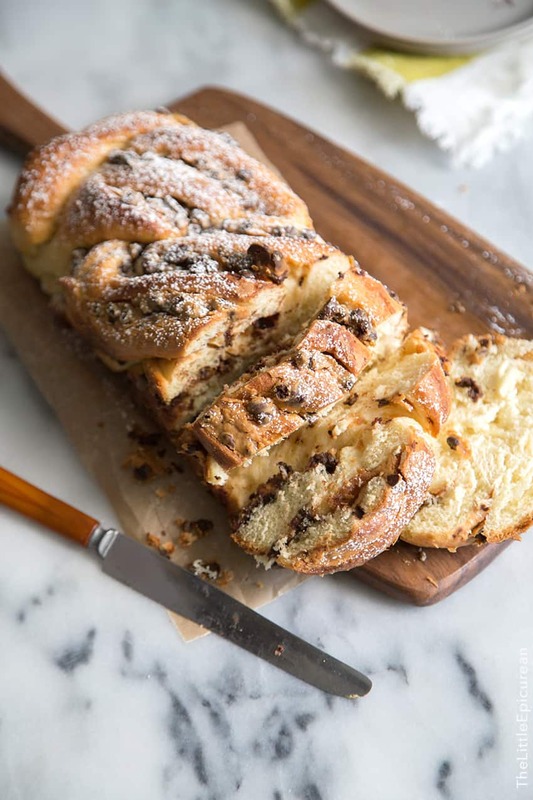 Place twisted dough into a greased 9x5-inch loaf pan. (Alternatively, you can also use an 8 or 9-inch round cake pan. 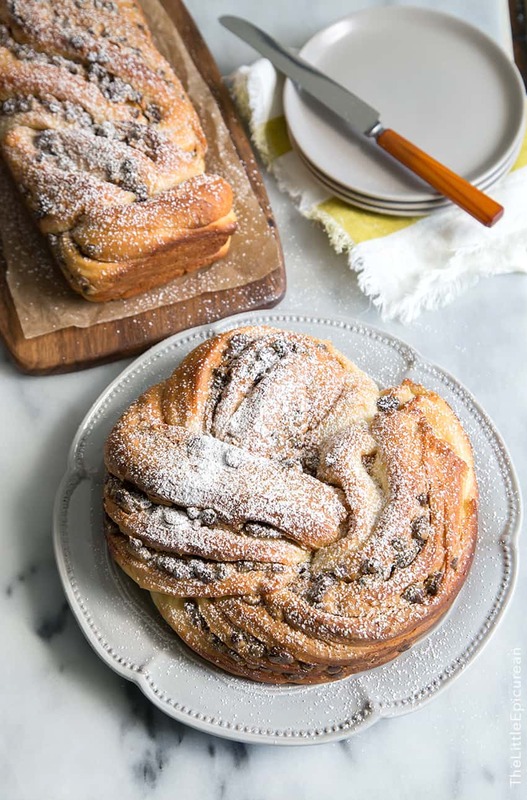 Simply connect the ends of the twisted dough to create a round shape.) Cover dough with plastic wrap and let bread rise for 45 minutes to 1 hour until the bread has reached the top of the pan. Meanwhile preheat oven to 350 degrees F. Remove plastic wrap and bake for 35-40 minutes until the internal temperature of the bread hits 185 degrees F.
Let bread sit in pan for 5 minutes before running a knife or offset spatula around the edges to loosen from the pan. Let cool before slicing. It is best to use homogenous peanut butter like Skippy or Jif. Natural peanut butters that require refrigeration or stirring before use, will not yield the same results. we bought it from a bakery. Thanks for sharing! That twist is soooo beautiful.